I’m someone who uses Google Adsense on a website I own, the adverts cover the server and software costs of running the website, leaving me a bit of extra cash for myself, which i usually spend on things to create more content / reviews for the website i have. With that in mind i generally don’t mind seeing the odd advert here and there, as long as the website is not covered with them. However on to what this blog post is about… What i do think is really concerning is that if you Google some free software, for example Adobe Reader, the advert above the first result always appears to be an advert for a malicious download of that application. When installed this malicious download will install loads of ad-ware, spyware and other malicious software you really don’t want on your computer. 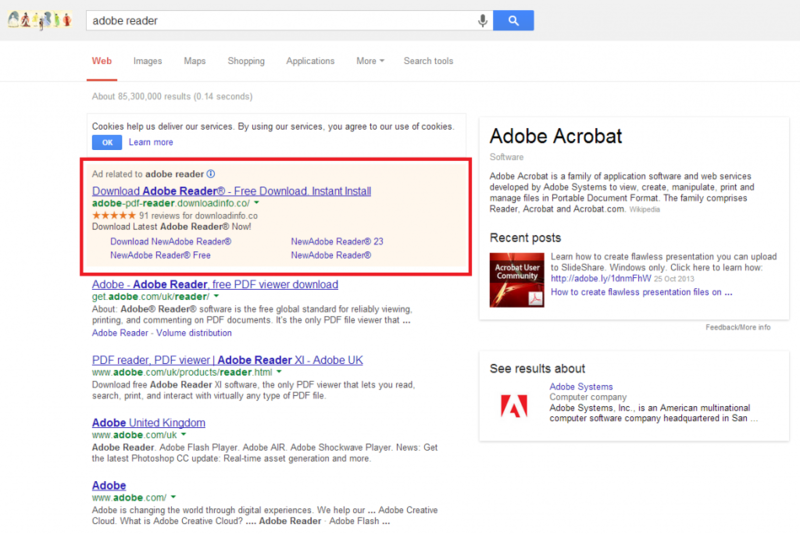 Below is a screenshot of the search results on Google UK when “adobe reader” has been searched for. If you look at the URL for that advert below its clearly not an official link from Adobe. 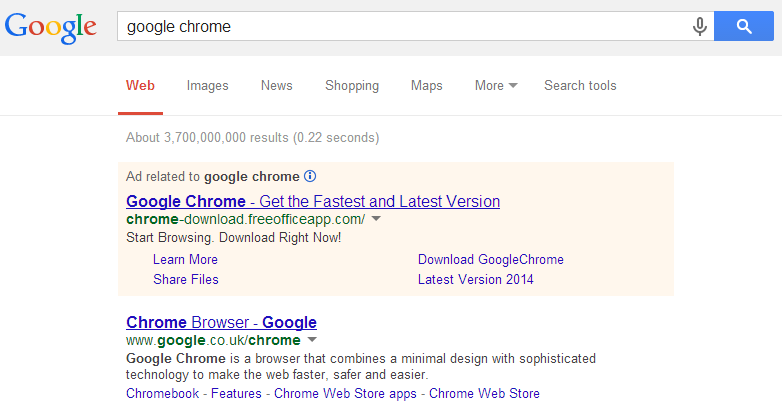 However companies appear to be using Google Adwords to trick people in to downloading their malicious software. I imagine its pretty well known people generally click the advert at the top of search results, and not the first organic search result. With that in mind i wonder how many people think they are downloadinga legitimate version of Adobe Reader and end up infecting their computer with spyware, keyloggers or ad aware? PDF’s are pretty much the standard way of sending a document to someone, for example an Invoice, so this appears a very easy way to get malicious software on to someone’s computer. It works too as i’ve seen it happen, which is the whole reason im making this blog post. Maybe this is not anything new, however as i usually block adverts in search results, so its certainly something i don’t see every day. Someone I know had got a new laptop, I was setting it up with a few programs for them. Anyway I left the new laptop updating (foolishly with this person), about half an hour later this person came and said “I thought i installed adobe reader, now my laptop is full of tool bars and security scanning programs”. So i went and had a look, then asked the person to show me how Adobe Reader was obtained. Basically the person went on Google, searched for “Adobe Reader“, clicked the first result and downloaded it. A website offering a download of Adobe Reader, which is actually a lot of fake security scanning programs. To be fair to the person in question. how is your average person who is not very tech savvy supposed to know the first download result on Google is malicious? 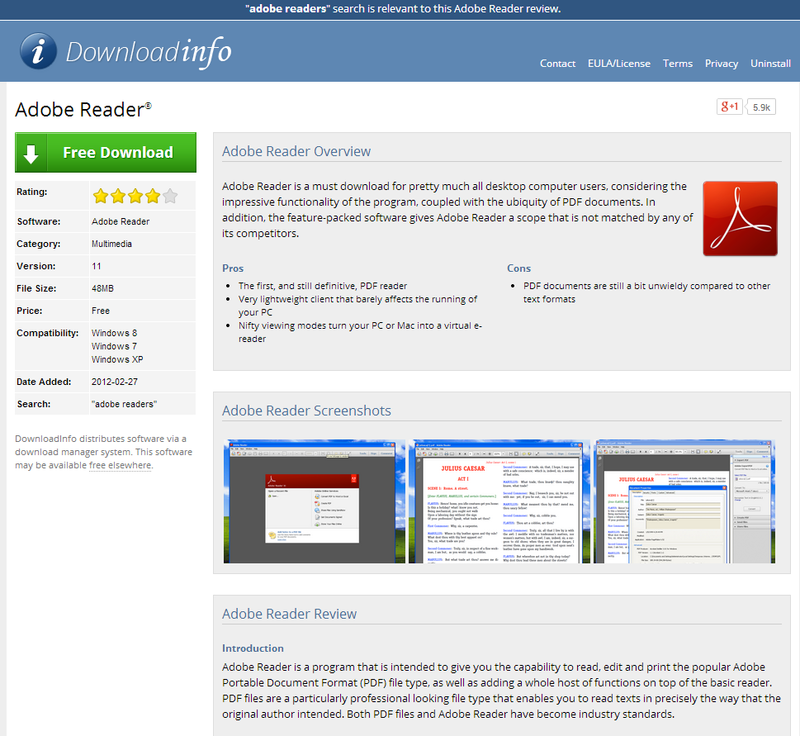 The above website has the Adobe Reader logo the person had seen before, screenshots of how the application looked, along with a good enough description. Did this person just get unlucky? You might think this person just got unlucky, well that screen shot was taken in October 2013, its now February 2014 and if you Google “Adobe Reader” the first paid for result still takes you to the exact same website in the screenshot above. I don’t want to link to any malicious websites like that, however do a search and see for your self. I would however be amazed if anyone is going to read the entire page and see that however. 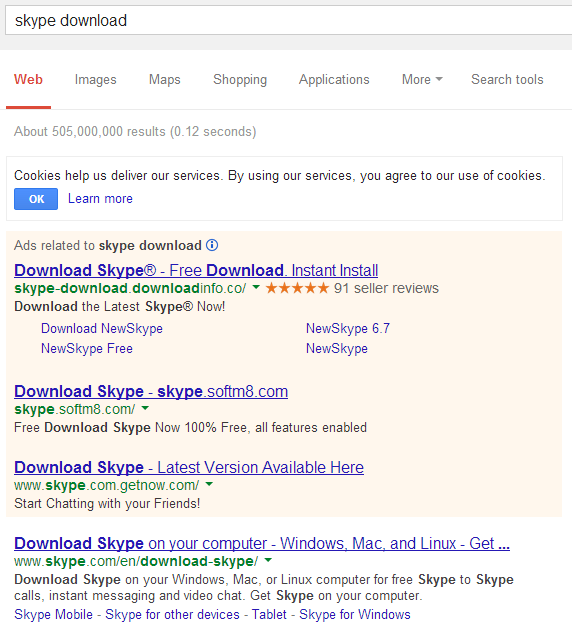 I still dont personally see how adverts like this are been approved by Google. I know from past experiences of running Google Ad-Word campaigns i’ve had to wait a few hours for my adverts to be approved. With that in mind i would think at least some sort of verification is going on after an advert has been created on Google Adwords. Without taking a million and one screenshots you will also find the same sort of thing going on if you search for other popular free software such as “Winamp”, “Google Earth Download” and various other free applications. So is this a good enough reason to justify blocking adverts? well to be honest your average computer user is probably safer on the internet with an ad blocker enabled, however as mobile devices and tablets are becoming more popular these malicious websites targeting Windows based PC’s are not going to have any effect. Regardless I think if your not a very tech savvy user you probably are safer blocking adverts in my opinion, however if you use a certain website a lot i do believe you should white list that website and see the adverts on it. If everyone on the internet blocked adverts a lot of popular website probably would not be able to afford to stay on-line. I guess its one of those catch 22 situations where something is been abused for malicious purposes. 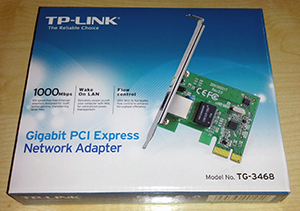 The TP-Link TG-3468 is a cheap PCI Express (1x) gigabit network card currently retailing for £5.98 on Amazon UK, the question i was wondering when purchasing the TP-Link TG-3468 was is this network card actually any good? The TP-Link TG-3468 appeared to get generally positive reviews on Amazon, however some of them did contradict each other. To cut a long story short it works fantastic on Windows 8.1 x64, however read on if your wanting to know a little more. Really its quite hard to say anything here other than it just works, i placed the TP-Link TG-3468 in a spare PCI express slot, power on my PC and that was that. Windows 8.1 booted and i had a network connection as soon as Windows had booted to the desktop. I didn’t have to even download any drivers. 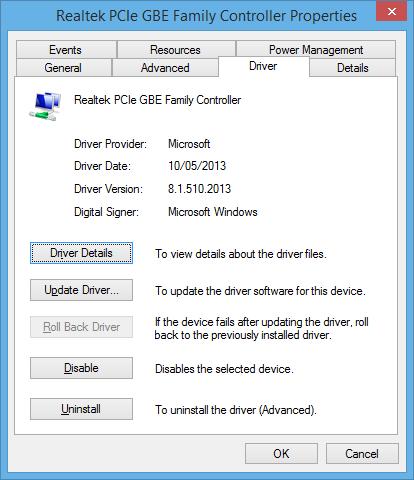 Windows 8.1 recognised the TP-Link TG-3468 as a Realtek PCIe GBE Family Controller and installed a driver from the 10/05/2013. Drivers on a CD included with the TP-Link TG-3468 support Windows XP, Vista (32bit and 64bit editions), Windows 7 (32bit and 64bit editions), however any Windows OS after XP will simply have drivers or download them from Windows Update. So needless to say if you have a version of Windows released in the last 12 years this Network Adapter will just work. 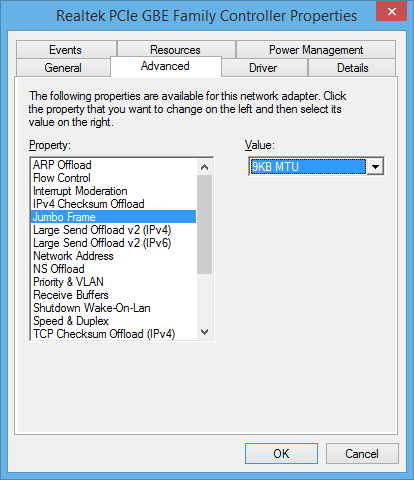 I can even confirm it works with Windows Server 2008 R2 and Windows Server 2012 R2. Apparently various Linux distributions also have support out the box too. 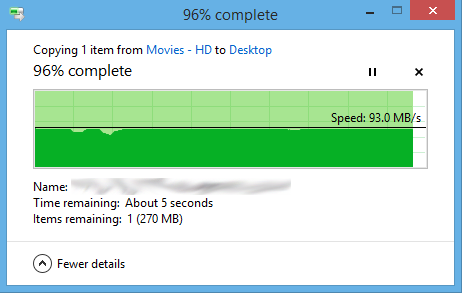 With the TP-Link TG-3468 i was able to copy files from my Windows Server 2012 R2 server to my Windows 8 PC at 93MB/s or 744mbps. I have no doubght the only limitation here is likely the hard drives i was copying from / to. I was copying from a Western Digital Green 4TB 5900rpm SATA3 hard drive to a Western Digital 500GB Green 5900rpm SATA3 hard drive. I’m sure with a faster drive the card would have been pretty much maxed out. Although 93MB/s is a lot higher than any of the reviews mentioned on Amazon. So basically if you wish to move large files around on your network the TP-Link TG-3468 will do the job perfectly. Something else worth mentioning here is that some Amazon reviews stated only 4K jumbo frames were supported, however i can select up to 9K. That’s about it really, in conclusion i don’t think for £6 you will be disappointed with the TP-Link TG-3468, it should be a great network card for the majority of people. The TP-Link TG-3468 can be purchased from Amazon UK. An apps button has recently appeared in my bookmarks bar on Google Chrome, linking to chrome://apps/. I personally don’t use any apps on Chrome and find its presence in my bookmarks bar a bit annoying, luckily however you can remove the apps button despite the delete option been inactive when you right click it. To remove the button you first need to right click it, then simply look near the bottom of the menu and un-check the “show apps button” menu item to remove the new button. That’s it, your day can now go on as normal. I must admit it took me a good half a minute to realise how to remove the button from Chrome, however that was at 6am, before my morning cuppa tea, so my excuse is I was half asleep at the time!